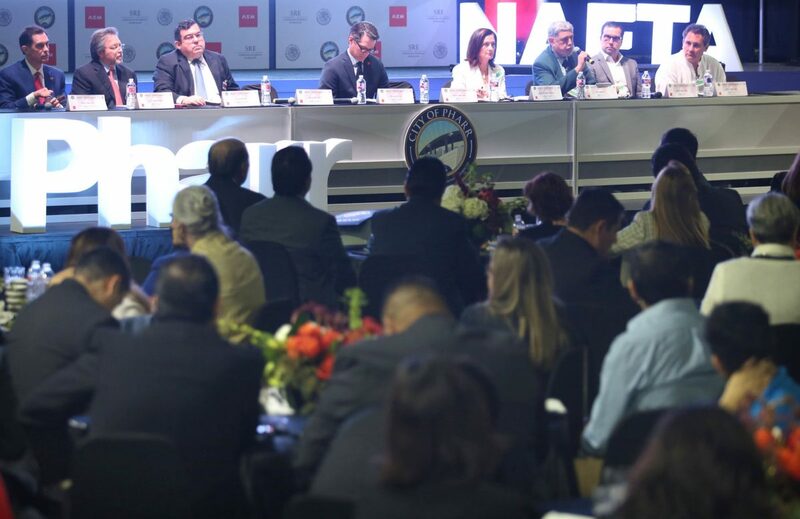 People listen to a panel discuss the effects of the North American Free Trade Agreement (NAFTA) during the RGV Seminar on the Bilateral Relationship Between Mexico and the United States on Friday, April 6, 2018, in Pharr. McALLEN — While manufacturing expanded across Texas in July, uncertainty in the trade community crept up, which could especially impact the Rio Grande Valley. A healthy United States economy led business executives across Texas to note an acceleration of activity in July, especially shipments from factories. The Rio Grande Valley economy has surged in recent months, with positive job rates and sales tax revenues growing in cities such as McAllen. However, some uncertainty lingers, according to surveys with business executives across the state conducted by the Federal Reserve Bank of Dallas. This uncertainty has existed since Donald Trump won the 2016 presidential election, especially following a campaign in which he called the North American Free Trade Agreement the worst trade deal of all time. Four months after Trump took office, he notified Congress of his intent to renegotiate the two-decade-old pact with Canada and Mexico. The three countries convened for negotiations in August 2017, but the talks publicly stalled in the Spring leading up to Mexico’s July 1 presidential election. On Monday, the U.S. Commerce Secretary Wilbur Ross said at a conference that NAFTA talks could wrap fairly quickly, especially since new Mexican President Andres Manuel Lopez Obrador has made swift appointments to his trade team. NAFTA transformed the Valley, which is also much more exposed to NAFTA harm than other parts of the country. Contreras cautioned that the magnitude of the trade policy impact could range from immense to hardly anything. There’s no way of knowing. But right now, Contreras said the country’s economy surging. And if there’s a time to get into a trade war, it’s now. “You obviously want to do it from a position of strength,” he said. As the year winds down, though, consumers may feel the steel and aluminum tariffs Trump imposed earlier this year. “Consumers will feel it at the store,” Contreras said, citing appliance prices, likely to jump. Mexico is likely to incur the worst impact, Contreras predicted.